Why Doesn't Microsoft Dump the Registry? - Ask Leo! The registry is just a database, and needed for the complex issues it solves. It's true that things can go wrong. Why is there a registry? It seems like so many problems with Windows center in the registry. Why not replace with something else that works? Contrary to popular opinion, the registry isn’t broken. The registry is just a structured database of information – nothing more, nothing less. Let me explain. Why do we have a registry? Programs (like Windows) need to have some place to store different kinds of information. Providing a common source makes a tremendous amount of sense so that all of these applications aren’t reinventing the wheel. This is particularly true when you factor in things like security ramifications. The registry provides an incredibly robust security model. That keeps information private when it needs to be. It also enables features that most home users admittedly don’t care about but corporations do. Things like portability, the ability to migrate your settings from machine to machine automatically as you move around your corporate network. There is structure to the registry but at times it really appears completely ad hoc. Even when it’s clear, there’s nothing to really force application writers to use it in the correct way or with the correct structure. Because it’s so robust, the programming interface to the registry is correspondingly complex. It’s easy for applications to get it wrong and some do. And that’s where some of the registry-related problems start. There’s actually nothing that forces an application to use the registry. Programs that want to, can certainly use .ini files, the most commonly suggested alternative. Windows itself pretty much must use something more complex because of all of the different and complex scenarios and needs that it’s attempting to address. 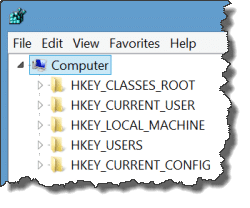 Many applications find themselves in a position of choosing to use the registry, because they fall into that same category of wanting to solve the same problems that Windows has already solved using the registry. The bottom line: it’s not really the registry that’s at fault here. It’s the data that it contains that can have problems. The data can be wrong, and that’s no matter how it’s stored – whether it’s in .ini files or otherwise. The problems being solved here are complex – more complex than most people realize. In many cases, most of the simpler alternatives just don’t cut it. Applications are absolutely free to avoid the registry if they want to, and they can still meet their goals. I know of many applications that do. But no, don’t expect the registry to ever go away. How do I Repair My System if the Registry Can’t Be Loaded? - We can certainly find a way to repair your system registry. But my concern is, why did this happen in the first place? « Previous post: Will Malware Infect the Backups on My Connected Backup Drives as Well? Thanks once again for a very good article! I’ve been having issues with one of my screen readers for quite awhile, and upon reading this article it sounds like my registry might need to be cleaned out. I’ve tried CCleaner and had what appears to be minimal success. Are you aware of any other registry cleaners out there that are accessible with screen readers? Unfortunately, registry cleaners often do more harm than good. Leo’s What’s the Best Registry Cleaner? recommends a couple which are safer than many others. One of them is CCleaner. Registry bloat is one of the reasons Windows is so slow, and gets slower every month. When one removes a program, it hardly ever cleans up all of its registry entries. “It seemed like a good idea at the time,” but it’s broken now. I was watching a University of California channel interview a few years back of an older gentleman who supposedly either invented the Registry or was in charge of developing it. He more or less said it was a mistake and was mainly created to thwart software piracy. But I don’t always believe what I watch on TV. Hmm, an interesting article: I’ve always wondered whether the advantages of having a registry, as well described by Leo, outweigh the disadvantages. The disadvantages include having to install and uninstall programs, rather than just running them directly from the original files, and also the fact that the system can be rendered non-operational by registry errors and conflicts. Microsoft introduced the registry with Windows 3.1, but I hear that other systems, such as Mac and Linux, have not followed suit, so whether it is desirable or not is clearly still a contentious issue. I can well believe it was mainly created to thwart software piracy and that its creation was a mistake: I have certainly wished it away several times!